We might want to put two videos side by side for a number of reasons. Sometimes it is because we might want to look at the same thing, but from two different perspectives to grasp a better idea of it. At others, it's simply because we want to draw comparisons in two different plots at the same time that we want to look at them playing side by side. Sometimes you might want to compare the quality of two different videos for which you would want to play them at the same time to make a better judgement. People who share content online on sites like YouTube might want to use this feature in order to create an interesting video. In this article, we will show some of the best video editing software to play two videos side by side on Windows and Mac, also the step by step tutorial of how to make a split-screen video to put two or more videos side by side and how to use video overlay to put videos side by side in details. If you don't know how to put two videos side by side, you can use different software that can help you achieve what you want to do. 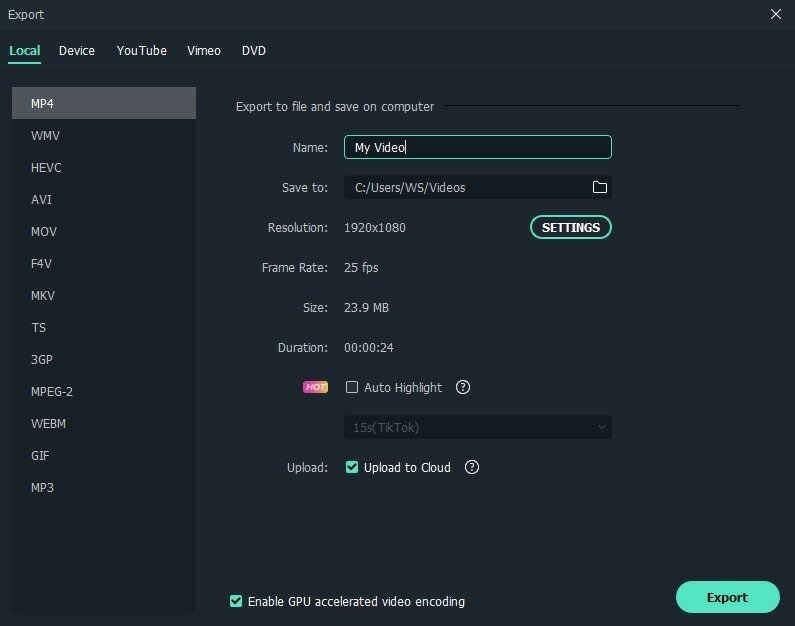 You can pick any videos from your library and without any problems, you can trim and split videos and put them side by side. Besides that, it allows you to add audio files from your library as well to add to your videos, and you can use several formats for audio as well like AC3, MP3, WMA, WAV, AU, AMR etc. It also lets you upload video to YouTube, Facebook and other social media which support videos. You can easily burn the video to DVD too. 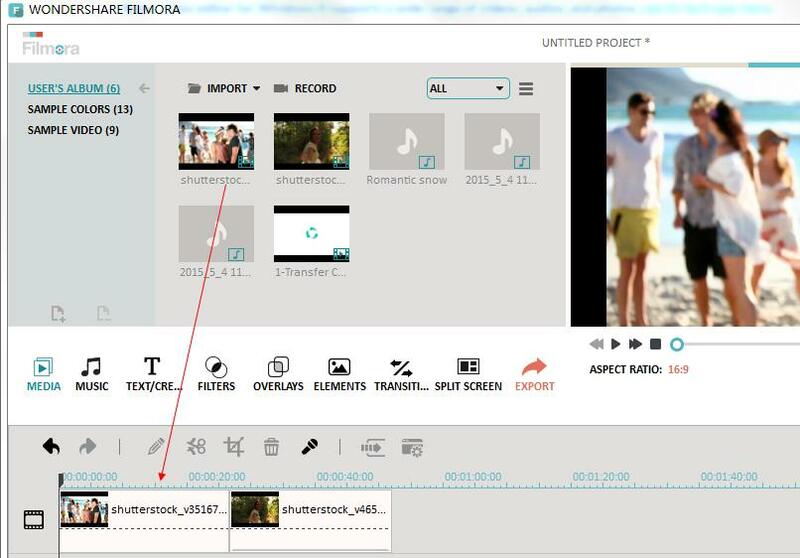 Wondershare Filmora9 also provides other video effects through which you can add credits or other text to your videos. It lets you make transitions more attractive as well as allows you to add sound effects. You can easily add other effects as well to enhance your video colors. Besides the basic tools, it gives you advanced tools which lets you add a picture-on-picture, Mosaic, Face-off, tilt shift your videos etc. When you are done with editing, you can save it to your laptop in any video format of your choice. Considered as one of the best applications which can help you put two different videos on the screen at the same time. It helps you add other effects to your video as well. If you are working with Master Clips, the app will automatically work more smoothly. However, there have been some issues detected when you are running this app on your MacBook. Another setback of this software is that you have to rent the tools that you are using which means that you have to pay for them. Another efficient software for splitting videos is Final Cut Pro X 10.2. In addition to splitting your screen to add two videos at the same time, you can use many other features as well to enhance your content. It also allows you to refine the colors of your video by providing different tools. However, if you are a new user, you have to pay more. Furthermore, there are no integrated tracking options for mask effects. As iMovie is coming with all new iPad and Mac computers, you can now directly use it to edit and make split-screen video without any further installation, which makes it a good choice to put two or more videos side by side. The process of making a side by side video in iMovie is using the Video overlay settings, which means you put two videos on different tracks and make sure that one is just above another, and then adjust the position in the preview window to make it side by side. You can check the video tutorial below to make a side by side video in iMovie. For the detailed step of making split screen video in iMovie, you can check How to use the split screen in iMovie for Mac. Step 1: Import video files you want to use to the media library. 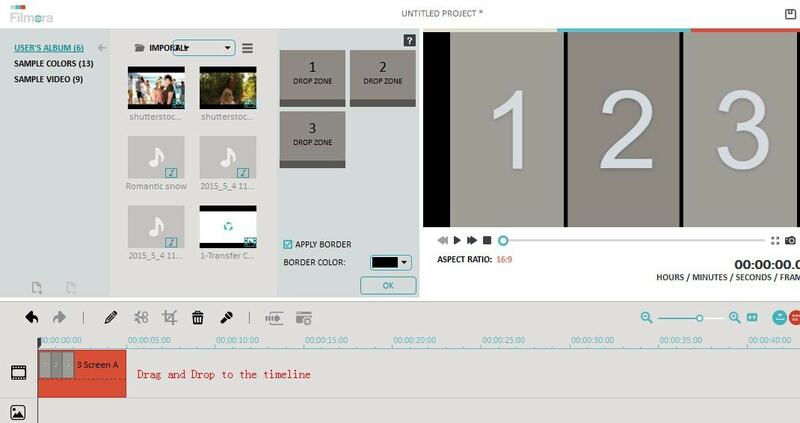 Step2: Click split screen button, pick the target preset you want to use for your video and drag it to the timeline. 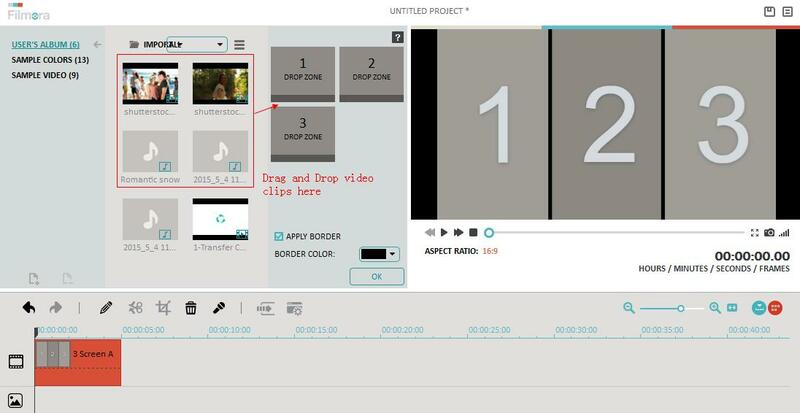 Step3: Drag the video or image to the Drop Zone to create a split screen video. Adjust the slider at the bottom of the Drop Zone to change the starting point of each video clip. Note: when you play back these side by side videos, you may hear all audios from these video. In this case that you just want to keep one of it, just click the Volume icon in the Drop Zone to mute others video audio. If you don’t want any audio from these videos, you can turn it off and then add your own audio file. You can also apply a Border to each sub video clip and change the border color to make the side by side video stand out. Step4: Click Export and save the split video to different formats, upload to YouTube or burn to DVD. Besides putting videos side by side with the split screen feature in Filmora9, you can also make it by using the video overlay feature, or PIP feature if you prefer. 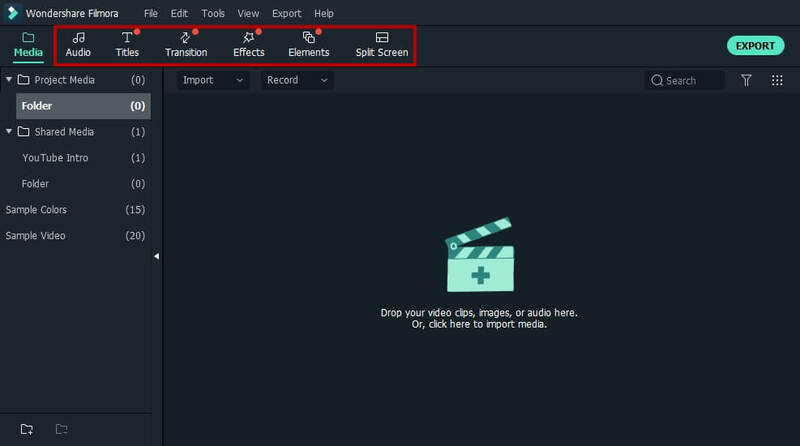 Follow the steps below to check how to placing videos side by side. Follow the above mentioned importing steps to load the video in Media Library. Drag and drop the videos to various tracks and make sure that they have the same duration. Drag the yellow box in the preview window and adjust the positions and size of each video to make it looks good. Or you can double click the clip in the timeline and then change its position, direction and scale under the Transform option. Mute one audio of the video or both of them, and use your own audio file or the audio effects from Filmora9's Audio Library. You can also caption the videos with some cool text effects. After the previewing, click the Export button to export the side by side video in different formats or upload to YouTube and Vimeo directly.